Too few Americans are aware that early advocates of Mother’s Day in the United States originally envisioned it as a day of peace, to honor and support mothers who lost sons and husbands to the carnage of the Civil War. In 1870 — nearly 40 years before it became an official U.S. holiday in 1914 — social justice advocate Julia Ward Howe issued her inspired Mother’s Day Proclamation, which called upon mothers of all nationalities to band together to promote the “amicable settlement of international questions, the great and general interests of peace.” She envisioned a day of solemn council where women from all over the world could meet to discuss the means whereby to achieve world peace. 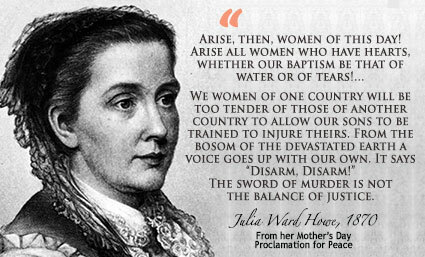 Julia Ward Howe was a prominent American abolitionist, feminist, poet, and the author of “The Battle Hymn of the Republic.” She nursed and tended the wounded during the civil war, and worked with the widows and orphans of soldiers on both sides of the war, realizing that the effects of the war go far beyond the killing of soldiers in battle. The devastation she witnessed during the civil war inspired her to call out for women to “rise up through the ashes and devastation,” urging a Mother’s Day dedicated to peace. Her advocacy continued as she saw war arise again in the world in the Franco-Prussian War. As the call for a Mother’s Day carried on, it gained new momentum and finally became a national holiday in the early 1900’s with the lead of Anna Jarvis, who had been inspired by her mother, also named Anna Jarvis, who had worked with Julia Ward Howe in earlier efforts for a Mother’s Day. While Mother’s Day has presently lost much of its early edge for justice, it’s important to note some of the underpinning intentions and re-commit ourselves to its prescient calling. At a time when our country is again engaged in devastating and costly wars abroad and many of our own communities are torn apart by violence, it’s time for Mother’s Day to return to its roots. In the spirit of Ward Howe’s original call, this occasion can be a time to dedicate ourselves, on behalf of mothers, fathers, sisters and brothers everywhere, to rise up and protect our most vulnerable by calling for our leaders to make a directional shift in the course of our nation. 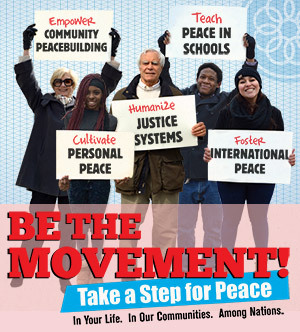 There is no need more urgent than addressing the devastation brought on by violence in all of its forms – affecting the lives of untold millions in our nation and around the world. Then, we may finally see the carnage and devastation of violence and war fade into its own history. There could of course be no better way to honor our mothers. We will not have great questions decided by irrelevant agencies. to allow our sons to be trained to injure theirs.